Previous Post Christmas Jumper Day – Update! 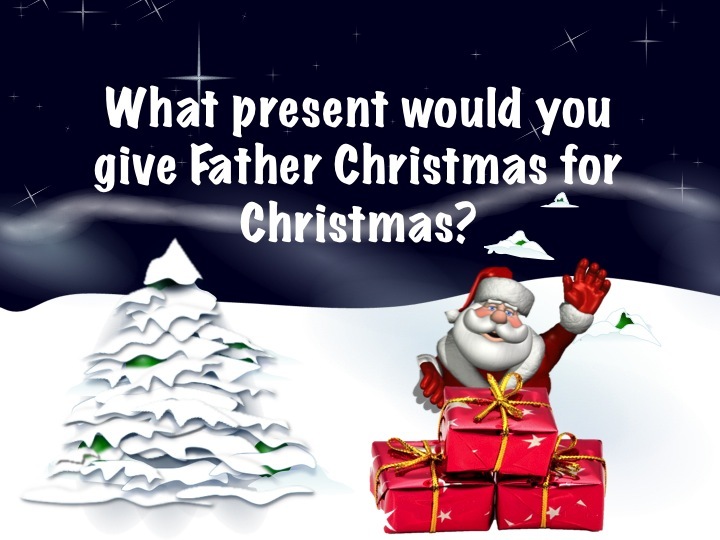 I would leave Father Christmas a box full of kindness and love. I would give Santa a slay because he’s been doing this job for a long time that slay must get rusty and he needs a 21 sentry high tech slay. I love Eden Marie’s suggestion of an exercise machine so that he can lose weight. I would give santa a very big present because he has given presents all over the world. I would get santa lots of robots to go down the chimney for him so that he does not get stuck. I would give him a week off and tell him to come back in January. If he were real I would bring Christmas to him but he seriously does need an excersize machine. I would give him a gift of thanks and love for all of his hard work. However it depends if people believe in farther Christmas or not. I would give Santa Clause a thank you card for delivering all the presents and I’ll give him a snow globe of him riding his reindeer.